Northfield Park is a harness racing racetrack in Northfield, Ohio, U.S.A., a community near Cleveland. Northfield Park conducts more than 200 race nights each year. Originally constructed in 1934 by Al Capone, Northfield Park racetrack, then known as Sportsman Park with a focus on midget car racing. After 20 years as a successful car racing facility, interest began to wane and in 1956, Sportsman Park was demolished to make way for what would eventually become one of the nation's premier harness racing tracks under the leadership of Carl Milstein, a well known real estate developer and businessman. Carl Milstein purchased the track in 1972 with New York Yankees owner George Steinbrenner. The tracks' top race, The Battle of Lake Erie, has featured some of the greatest pacers in history including Jaguar Spur, Gallo Blue Chip, Falcon Seelster and Riyadh. 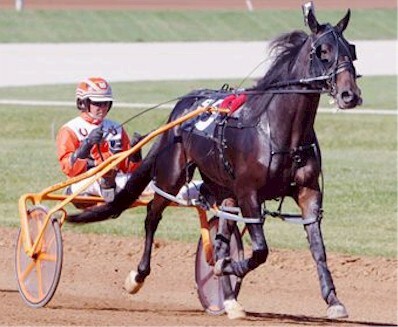 in 2007, the race was won by World Champion Maltese Artist, driven by Brett Miller in a world record time of 1:49.4 for the mile. Maltese Artist is expected to defend his title in the 23rd edition of the race, scheduled for Saturday, April 19, 2008. The track's nickname is "The Home of the Flying Turns" and its motto "Every nineteen minutes the place goes crazy." In the spring of 2008 Northfield Park constructed the Trackside Lounge. Trackside at Northfield Park is a state-of-the-art Sports Bar, featuring three-dozen flat-screen television monitors, private seating areas, full bar service and snack menu. In addition to Northfield's full simulcast agenda, Trackside broadcasts major sporting events including Indians, Cavs and Browns games, March madness, the World Series, Super Bowl, Nascar and more. The Trackside Barbecue features award-winning ribs, pulled pork sandwiches and more, and food from the barbecue can be brought into the Trackside Lounge, or eaten in the barbecue tent pavilion. Cedar Downs is the only off-track betting parlor in the State of Ohio and is owned and operated by Northfield Park. Cedar Downs is located in Sandusky, Ohio. Northfield purchased the facility, located at the entrance to the Cedar Point Causeway, in the summer of 2005. It had previously been operated by Raceway Park, a Toledo, Ohio, harness track. A unsuccessful measure on the Ohio election ballots in November 2006 would have legalized slot machines in Ohio, many of which would be located at racetracks in the state The state legislature is now considering allowing instant racing machines that look like slot machines but actually involve handicapping videos of previous races, with parimutuel wagering. These machines have doubled purses in Arkansas, where they were first developed.In early 2009, the Ohio Legislature initiated legislation that would allow each of the state's seven tracks, includign Northfield,to install 2,000 slot machines, under guidelines developed by the Ohio State Racing Commission.In July of 2009,Slot Machines were approved,and will soon be installed to Northfield Park. Northfield Park's owner Brock Milstein contributed over $500,000 to the campaign to legalize slot machines.